3rd prize : Andres Fernandez (Costa Rica), Saul Bautista (Mexico), Ramòn Espinosa-Solis (Mexico), Claudio Boschini (Italy), Gerardo Langone (Italy). Lac-Mégantic’s Canada Man/Woman’s uniqueness stems from its wild, intense, and authentic character. As athletes enter the Lac Mégantic waters at dawn, they will embark upon the experience of a lifetime, one that goes way beyond a race against the clock. Participants will brave the cold water for 3.8 km before taking in breathtaking scenery as they complete a 180 km biking section with an elevation change of 2 500 m before finally running 42 km, for the most part along running trails that will take them through the forest, amidst the Canadian wilderness, facing yet another elevation change of 1 600 m.
The goal: reach the summit of Mount Mégantic, a viewpoint that towers over the region. 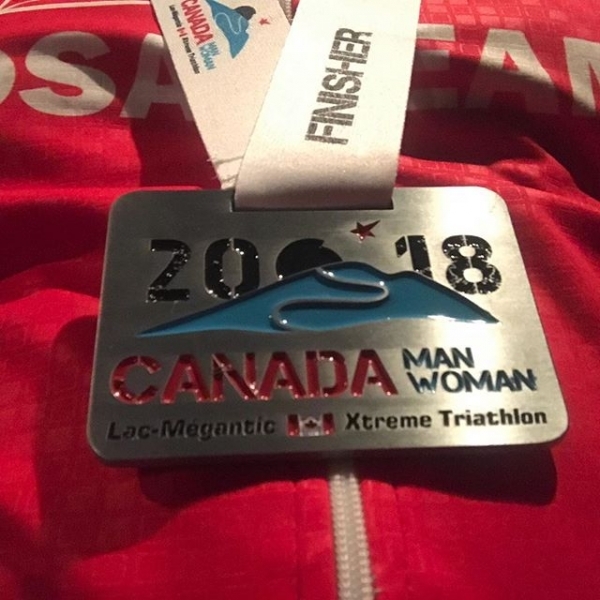 The Triathlon Canada Magazine has stated that the Canada Man/Woman was the #1 among the 10 Must Do Races in Canada in 2019.